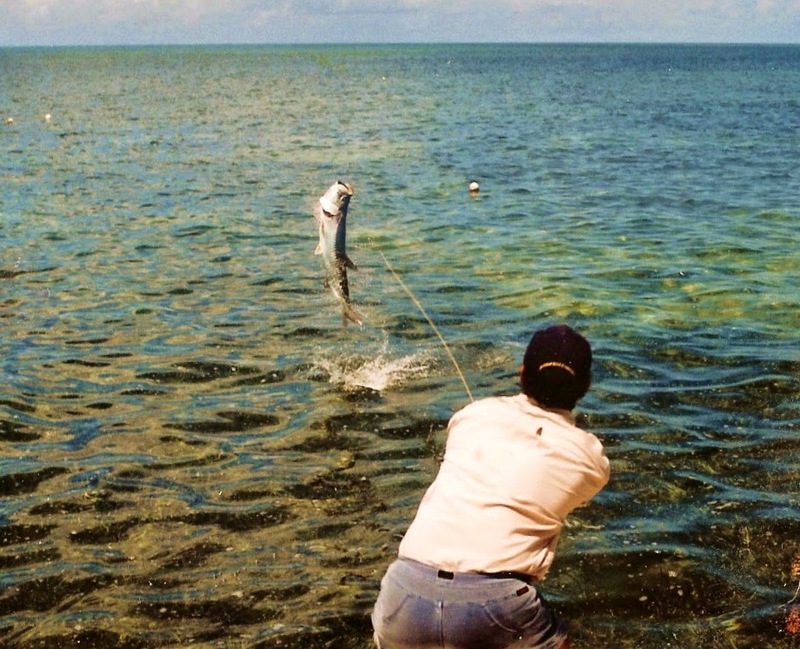 It’s been almost twenty years since I guided my first client to a tarpon on a fly and, remarkably, a lot has changed with the sport in that relatively short time. Tarpon fishing was born right here in Southwest Florida on March 25th, 1885, when the first one was caught on a rod and reel off Punta Rassa. The angler’s name was William Wood and he used a five foot bamboo rod and a solid steel reel holding just over 200 yards of spun linen line. His guide was Capt. John Smith from St. James City whose boat was a ten foot wooden skiff that he rowed after the fish with a pair of oars. He didn’t use an outboard motor because those didn’t exist back then. Here are a few other things that also didn’t exist back then: sunblock, sunglasses, bug spray, clothes made of something lighter than wool or heavy cotton, cameras that weighed less than thirty pounds, cameras that took less than thirty seconds to take a photo, and any method of communicating with someone on another boat or the shore except shouting. In other words, William Wood and Capt. Smith’s first tarpon didn’t happen all that easily. So let’s fast forward to my first tarpon 111 years later. I was poling a fiberglass hulled Maverick Mirage powered by a Johnson 70hp two-stroke outboard. It could hit 30mph and float in just under a foot of water fully loaded. (Sorry Maverick, but you were exaggerating a bit in your brochure about this boat’s alleged six inch draft.) 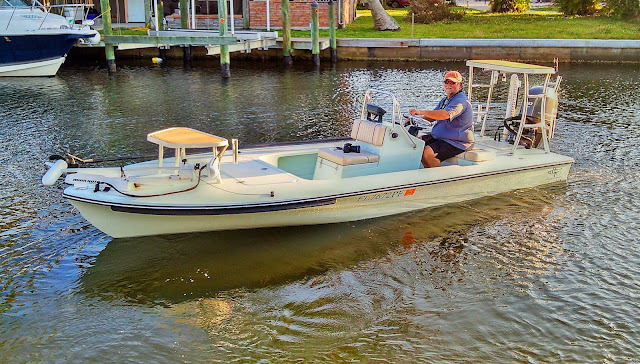 This was the state of the art fly fishing skiff back in 1996 and it put me on a pile of tarpon over the next ten years. My angler was casting his 12-weight Sage RPLX fly rod mounted with a Billy Pate anti-reverse reel, also state of the art for the time and horribly expensive. The entire outfit cost over $1200. His fly was a 4/0 Cockroach pattern that I selected from a stretcher box of a dozen flies pre-tied to monofilament leaders that took me almost an hour each to assemble. Before I handed him his rod I double checked all five of the different knots that made up the entire ten foot leader system and then sharpened the hook with a small file. A lot of thought and effort still went into catching these fish in the late 20th century. The tarpon my angler caught that day wasn’t even close to a record setter, perhaps fifty pounds at the most, but I still hauled it up on the deck and marveled at it like it was the Lost Ark. I pulled out my Cannon Eos and snapped off an entire roll of Fuji 100 film, which cost me $12 to develop and only two of the pictures turned out nice enough to keep. That fish did swim away after a lot of reviving but I’m sure we didn’t do it any favors during that two minute photo session. So let’s jump ahead to Tarpon Season 2014 and talk about how things have become even easier guides like me and our anglers. My current boat is a Beavertail BT3 which is larger, lighter, and faster with the same amount of power as my old Maverick. Its four-stroke Yamaha even burns less fuel and no oil. When I’m fishing in the deeper water off the beach I use a remote controlled Minn Kota trolling motor to get me on the fish quicker than I ever could with a push pole. I still own a few of those older $1200 fly rod and reel combos but the most recent tarpon rod I purchased last year was a 12-weight Temple Fork BVK that retails for only $250. Advanced graphite is easier than ever to produce and these rods cast as well as anything else at three times the price. I also picked up a matching BVK reel for the same price. This machined aluminum fly reel weighs almost half as much as those legendary Billy Pates and is just as capable when it comes to taking down a full size tarpon, and you don’t have to skip a mortgage payment to own one. That big stretcher box full of flies and pre-tied leaders has disappeared thanks to the arrival of fluorocarbon. I ditched the stretcher box ten years ago and now just keep a few spools of Seaguar in my tackle bag to whip up leaders as needed. And my tarpon flies are tied on amazingly sharp Owner hooks which never need touched before you rig them. This is a huge time saver both at home before the trip and on the water. Documenting your catch has also never been easier. My current cameras are a pair of Nikon digital SLRs that allow me to capture an almost unlimited amount of images each day, all basically free of charge and stored on memory cards the size of my thumbnail. And these cameras are no more expensive than their film consuming older brothers from a few decades ago. Even more amazing are the smart phones that we all carry with us. Most are capable of taking not only fantastic still photos but they can also shoot high-definition video that a $70,000 broadcast camera couldn’t match back in the 1990’s. Throw in a couple of apps like GPS and real-time radar and you’ve got something in your tackle bag that Star Trek never even predicted. So for those of you who think that fly fishing for tarpon has only gotten more difficult, I disagree. Yes, there are more folks out there doing it but the gear has never been better and the learning curve has never been smaller. It still takes time on the water to get really good at it but all the cost barriers to chasing silver kings on fly have been knocked completely down in the last decade. It’s never been easier to become part of a sport that was born a century ago right here in Southwest Florida, and you don’t have to climb into a wooden rowboat to do it. The water temps finally crossed the magic 76 degree threshold and the tarpon are starting to flood into Charlotte Harbor. They're only a month late but I'll take them any time I can get them. Hopefully this means they'll stick around a little later this summer and into the fall. We didn't land the one in the photo about but at least he posed for me nicely. Congrats to my buddy George for picking up this excellent BT Vengeance with a Yamaha F70. That makes five of these skiffs right here on Matlacha alone. The entire lineup of Beavertails are all selling like crazy right now and at least two new models will hit the market later this summer. This is an amazing success story for a relatively small company that is quickly becoming the dominant skiff builder in Florida. Nothing to do with fishing but this brown anole has been hanging out with me on my back porch recently and keeping the place bug free. Good news. 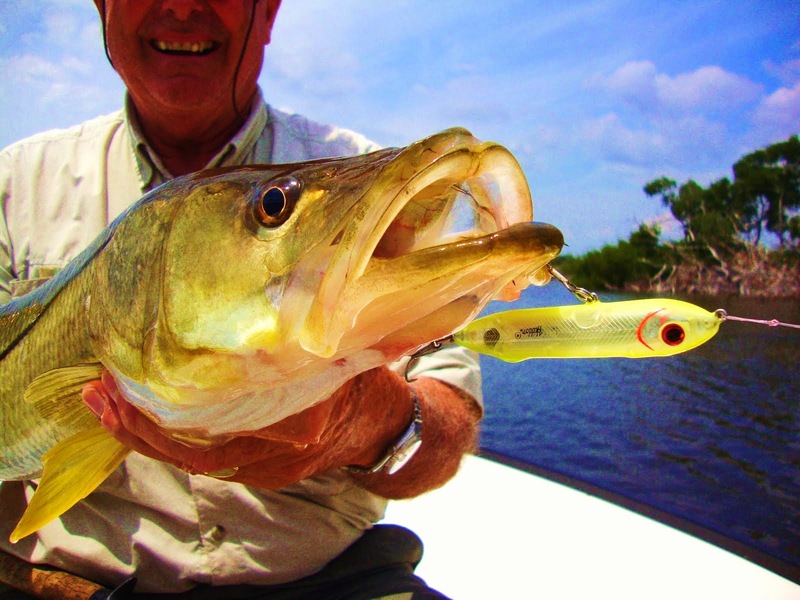 The snook are finally hitting the artificials. That hasn't happened for me with any kind of regularity yet this season but something seemed to set them off late last week. Landing them has been a different story. I've had a pair of monster snook in the 20lb. range bust right through the leaders and a dozen smaller ones simply blast the lures right into the air and miss the hooks entirely. It's a riot to watch but frustrating at the same time. Keep the retrieve slow and they'll usually come back and hit the bait a couple times until they feel the metal. The standard Zara Spook in the photo above is a proven winner but I've been introduced to a new popper that's been drawing some explosive strikes. I'll post some more about that one later this week. I don't see this happen every day. It's been a while since I added an new artificial to my lure box. I've been more than content over the past few years with Zara Spooks for top water action and Gulps for everything else. That changed recently after another guide told me about the big trout he was landing with the Mirrodine Suspending Twitchbaits. When he showed me a photo of a pair of 20 inchers that hit the same lure, with one fish hanging from each treble hook, I was convinced and ran out and bought a handful. He made me a believer and the gator trout in Matlacha Pass have really been responding to these excellent baits from Mirrolure. Best of all, they're effortless to use. I can hand a rod with a Mirrodine to an inexperienced angler and have them working it perfectly with very little instruction. You just reel and stop, reel and stop. It's that easy and the gator trout can't turn it down. Every tackle shop in the area sell these so if you don't have one in your box, go out and get two. I can't get enough of these amazing scavengers, and that's what they really are (at least here in SW FL.) The one in the photo is half of our local nesting pair that I've named Fred and Wilma. I don't know which one it is because the male and female bald eagles are indistinguishable from a distance. Up close the females are a bit larger. The fish in its talons is a small black drum which it stole in mid-air from an osprey. This seems to be the only way that any eagle gets its food while nesting down here in the winter. As a matter of fact, the only time I've ever seen a bald eagle swoop down and snag its own fish from the surface of the water has been on TV. So the may be shameless thieves in these parts but they're also the most beautiful thing that flies and I never get tired of watching them while they're here. My buddy Forrest heading out last Saturday morning in his tricked out Gheenoe. I'm starting to forget that the water in Matlacha Pass can actually look this nice. Our local pair of bald eagles with a big mullet, which they stole from an osprey. No shortage of big trout out in Matlacha Pass right now. The photos above show a pair of 23 inchers that my anglers landed over the past two days and we've spotted dozens that were even larger. White streamer flies and shrimp under corks have been getting the best results but they only seem to be active during the higher tides of the late afternoon. Boston angler Phil Michaelson with a 23 inch red on fly from this morning. We finally had a day full of perfect weather and almost non-stop redfish out in Pine Island Sound. Once the tide started moving over the turtle grass the fish came out in waves. The reds were a bit spooky with the calm winds but they're schooling up in big numbers just like they did this time last year. The water temps are still about ten degrees below normal, but that should change by the end of the week. I think we're in for a very good April, which is always one of the best months to fish around Pine Island.